Field Rental & Sales Rep.
*Bristle wear charged at $125 per inch. *Customer responsible for damaged blades. **Installation and damage charges additional. ***10% blade wear surcharge or actual blade wear cost will be added to rate, whichever is greater. ****Customer responsible for broken/missing teeth. *Bristol wear charged at $125 per inch. **Customer is responsible for all jumper line damage & repair. **Customer is responsible for isolator replacement. ***Customer is responsible for greasing hammer at recommended intervals. ***Customer is responsible for all hydraulic hose damage and repair. ***Customer is responsible for all tool repair and damage. *Quick coupler unit available w/forks. **On all crawlers, listed 4 week rates allow for a maximum of 125 hours. Monthly rentals will be charged 1/125th the monthly rate for every hour of overage. *Hydraulic quick coupler (QC) machines available. *With push block and rear ripper. *Accugrade and Top Con ready machines available. *Units subject to $195 cable inspection upon return. *3D modeling available at additional charge. *Customer responsible for any and all cable damage. *On-site assembly charges may apply. *Units subject to bucket pin & bushing inspection upon return. *Customer responsible for excessive bucket pin & bushing wear. *Additional fee to weld plate over teeth. *Customer is responsible for all damage and excessive wear to thumbs/grapples. *Customer is responsible for all damage, excessive wear & jumper line damage. *Price does not include blade wear or tooth wear. *Customer is responsible for all jumper line damage and repair. *Price does not include blade wear, tooth wear and maintenance. *10% blade wear surcharge or actual blade wear cost will be added to rate, whichever is greater. *Add $1,000/mo. for underwater kit. *Customer is responsible for greasing hammer at recommended intervals. *Customer is responsible for all hydraulic hose damage and repair. *Customer is responsible for all tool repair and damage. *Customer is responsible for isolator replacement. *Customer responsible for blade damage. *All On Road Vehicles subject to maximum monthly mileage allowance. Per mile fee maximum allowance based on vehicle type. Lessee is responsible for tire repair and routine maintenance at manufacturer's suggested intervals. *On road vehicles subject to maximum monthly mileage allowance. Per mile fee and maximum allowance based on vehicle type. Lessee is responsible for tire repair and routine maintenance at manufacturer's suggested intervals. *All Trailers brake & tire wear to be assessed. *SkyPower Generators and Sky Welders available on most units. *Unit subject to $195 cable inspection upon return. *Customer responsible for any/all cable damage. **On-site assembly charges may apply. *Diesel & dual fuel available. *Unit subject to cable inspection upon return. *User subject to $195 cable inspection upon return. *Remotes and leads available at additional cost. *Double shift (8-16 hours/day) 1.5 x rate. *Triple shift (16-24 hours/day) 2 x rate. • A rental agreement must be signed, and account must be established prior to pick up or delivery. • Unless otherwise noted, rates are based on an 8 hour day, 40 hour week, & 176 hour month. Rates are based on time out not time used. Additional hours will be billed accordingly. 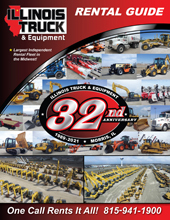 • Rental charges will continue on equipment until Illinois Truck & Equipment has been notified that the equipment is ready to be picked up and off rent number is obtained. • All equipment is delivered with a full tank of fuel. If equipment is returned without a full tank, Lessee will be billed at $5.50 per gallon. • Lessee is responsible for daily maintenance, unusual wear and tear and any tire repairs. vandalism. A certificate of insurance is needed in order to rent equipment. • Lessee will return equipment in a reasonably clean condition. • Lessee will be billed for excessive clean up at posted shop rates. • Lessee is responsible for all transportation charges. 0-50,000 lbs. - @ $120/hr. 50,001 - 80,000 lbs. @ $130/hr. 80,001 - 100,000 lbs. @ $140/hr. 100,001 - 120,000 lbs. @ $155/hr. NOTE: State and local permits are additional when required. • All rentals are subject to availability. NOTE: $250 call out fee will be applied to any rental required outside normal business hours.